Join the discussion on our forums! 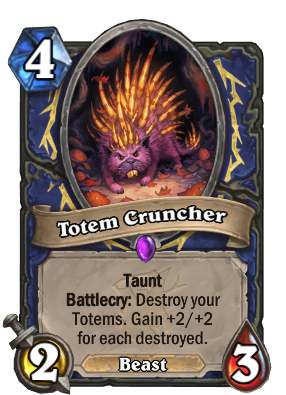 Come discuss Totem Cruncher over in our dedicated Totem Cruncher discussion topic. Battlecry: Destroy your Totems. Gain +2/+2 for each destroyed. When regular totem hours won't cut it. I think it's actually good minion , because often times you can summon a totem after playing this card , so it makes up for it. All flavor, no substance, 100% worthless. Play it by itself, you have a 4-cost 2/3 Beast with Taunt, objectively worse than Ironfur Grizzly; play your Hero Power and then summon it, you have a 6-cost 4/5, 4 for Totem Cruncher and 2 for his lunch, objectively worse than Rotten Applebaum, and on and on it goes. At no point in his power curve do his boosts justify his setup mana cost, because every totem he eats costs 2 mana (minimum) to put on the field, which basically means investing in zero-sum stat boosts of 2 mana for +2/+2 over and over on a minion already beneath the typical power curve... and that's without comparing it to other stat-boosting cards in the Shaman card list or mentioning the horrendous ordeal of setting up a field full of nigh-helpless totems before your opponent decides they're too dangerous to ignore and wrecks them all to stop you from using Bloodlust or something. Dust it and get yourself something nice. 100 Dust can do a heck of a lot more or you than this card can. i ve opened this card maybe 6-7 times so far. jesus rng. this ll be the reason for me to not open anymore ww pack soon. This card is working really well in Even Shaman on Legend. Check out my page for more details! Had this card said : unable to be targeted by spells or abilities it would earn epic status. It's just bad with how rampant silence is. I wonder if using this as a '1 of' in a Shudderwock deck would be good. 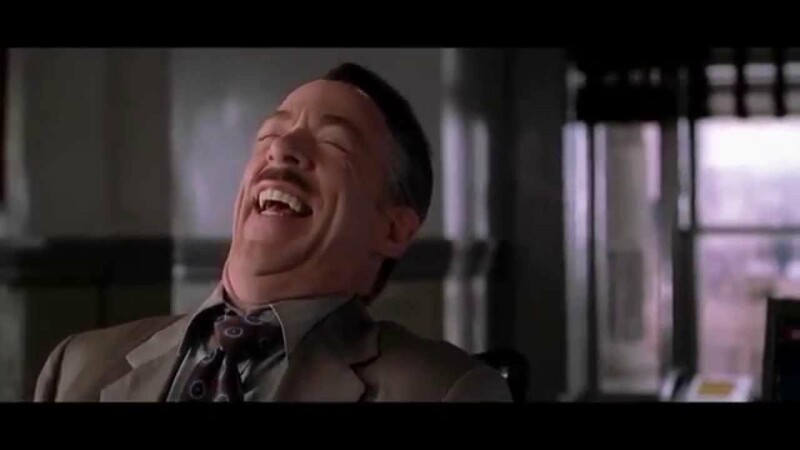 That way you don't run the risk of getting totems copied/put back in hand/put back in deck. Why would i use this over bloodlust? Actually having some mild success with it (But only at rank 7 at the moment). It's kind of similar to sea giant: You flood the board and then drop a cheap, grossly over-statted minion that your opponent has to deal with somehow (They can hex or poly it, but if you're running 2 sea giants and 2 totem crunchers that's not a huge deal). Pretty common to drop one of these guys on turn 5 and get an 6/7 or 8/9 taunt, or something even bigger. It's worse than even paladin, but more fun in my eyes. Blood Knight is a better version of this kind of card and doesn't see a lot of play. We need more deathrattle totems to make this work well, especially since their current count is 0. Reminds me of Void Terror which saw some niche play in a few decks. but mainly to kill something with deathrattle. Not much synergy to killing your own Totems unless they already have Primal Talismans cast on them. 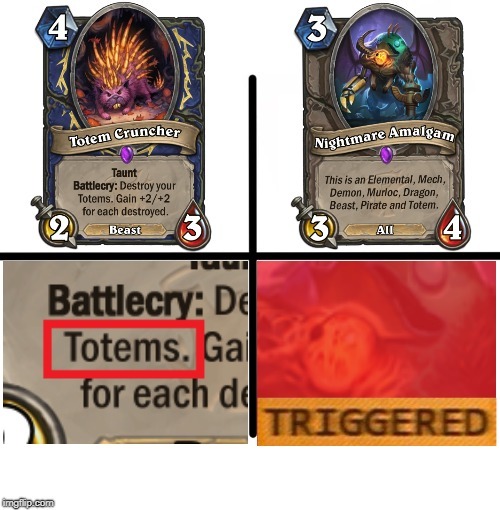 Comparing to Draenei Totemcarver it's a trash tier card. Destroying your totems, to get a big minion that would be hexed/polymorphed/removed is a bad idea. 4/5 at most cases. Even better if opponent keeps going face instead of clearing totems. Do not know if it's reliable though. Might be. Why is shaman always getting these awful cards. Like is there just 1 blind person who doesn't even play the game manager of the shaman class? No one thinks you're funny.